The new electron intraoperative radiation therapy (electron IORT) technology at Scripps uses a mobile linear accelerator to deliver electron beam radiation treatment into the patient’s open surgical site after the tumor is removed. Developed by IntraOp Medical Corporation, the IntraOp Mobetron® technology is housed on the campus of Scripps Memorial Hospital La Jolla. This is the only site in San Diego County to offer this highly advanced technology. Most breast cancer patients require approximately six weeks of conventional X-ray radiation therapy after breast-conserving surgery (or lumpectomy), but electron IORT can deliver a full week’s worth of radiation in about a minute. This can cut a typical six-week course of post-surgery radiation treatments down to five weeks, a reduction of about 16 percent. This modality also delivers radiation more precisely and effectively to the targeted tissue than conventional external beam radiation, because electron IORT has the benefit of direct visualization of the tumor site, no entry dose, little if any exit dose and a very uniform radiation distribution. 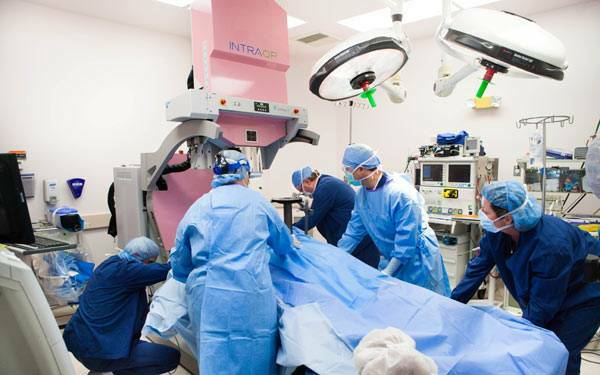 According to IntraOp Medical Corporation, this treatment for breast cancer has been available in Europe for more than 15 years and currently more than 20,000 women in Europe have been treated with electron IORT for breast cancer with excellent results. The electron IORT unit can be rolled into a standard operating room to deliver electron IORT directly to the tumor bed during surgery, immediately after the tumor is removed. Electron IORT delivers a concentrated, precise dose of radiation. Medical studies have demonstrated the safety and effectiveness of electron IORT therapy for breast and other tumor sites. The Mobetron unit received Food and Drug Administration approval in 1998. Medicare approved reimbursement for electron IORT in 2013. Electron IORT has an established history of reimbursement by many private health insurance payers. Scripps Health is a nationally recognized leader in cancer care, providing comprehensive care at its five hospital campuses and various Scripps Clinic locations. Scripps treats more cancer patients annually than any other provider in California for the following cancer types: breast, colon, bladder, lung (small-cell carcinoma), Hodgkin lymphoma and non-Hodgkin lymphoma. Scripps ranks in the top five statewide for the number of patients treated annually for cancers of the prostate, pancreas, kidney, lung (non-small cell carcinoma), thyroid and skin (melanoma).